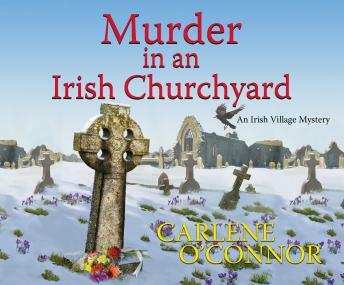 Listen to "Murder in an Irish Churchyard" on your iOS and Android device. It's official! Siobhan is now Garda O'Sullivan, and her five siblings couldn't be prouder. While her brother James runs Naomi's Bistro, Siobhan is doing her part to keep the village safe. Of course, Kilbane is pretty quiet compared to a place like Dublin, where Macdara Flannery has gone to be a detective sergeant. Then one night the local priest summons Siobhan to the church cemetery. There's a dead man in the graveyard-aboveground. He's a stranger, but the priest has heard talk of an American tourist in town searching for an Irish ancestor. A detective sergeant is dispatched from Dublin to assist with the case, and, as fate would have it, it's Macdara. Things have been awkward between him and Siobhan since he left, but their partnership soon unearths that the victim was from Dublin, Ohio. As they dig for a motive among the gnarled roots of his family tree, long-buried secrets are unearthed. Now, they'll have to stay two steps ahead of the killer...or they'll end up with more than one foot in the grave.